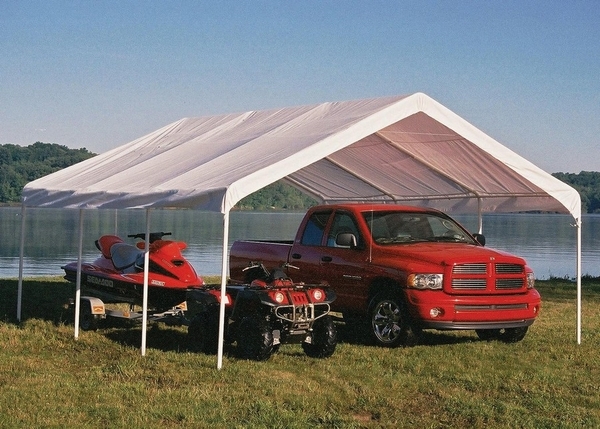 This canopy shelter is for when you need commercial grade protection for your storage and protection. This 18 foot wide by 20 foot long super max commercial grade eight leg canopy shelter is made by Shelter Logic, the experts in designing and manufacturing temporary shelters. In most cases, this shelter will not need a building permit. The shelter arrives at home or business with everything you need for quick and easy installation. The shelter has a ten year life expectancy. The unit is not snow load rated. You would need to physically go out and knock the snow off of this unit to prevent it from being damaged. Is this NFPA 701 certified? This item is only CPAI-84 Flame Certified. How strong a wind can this structure handle? This is a very sturdy structure, but is not wind rated. How tall are the legs of this canopy? The height measurement of the legs on this structure is just over 6'. This shelter carries a full limited warranty against defects in workmanship. ShelterLogic�, LLC warrants to the Original Purchaser that if properly used and installed, the product and all associated parts, are free from manufacturer’s defects for a period of: 1 Year For Cover Fabric, End Panels and Framework. Warranty period is determined by date of shipment from ShelterLogic�, LLC for factory direct purchases or date of purchase from an authorized reseller, (please save a copy of your purchase receipt). If this product or any associated parts are found to be defective or missing at the time of receipt, ShelterLogic�, LLC will repair or replace, at it’s option, the defective parts at no charge to the original purchaser. Replacement parts or repaired parts shall be covered for the remainder of the Original Limited Warranty Period. All shipping costs will be the responsibility of the customer. Parts and replacements will be sent C.O.D. You must save the original packaging materials for shipment back. What size and gauge is the metal? This has a 2-inch diameter frame. It is 13 gauge. Yes. This canopy is one of our waterproof models. 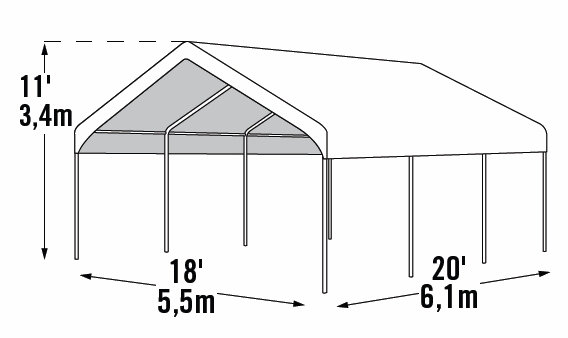 What is the canopy's height at its sides? Per the manufacturer, the height from the ground to the cross rail on this canopy is 6 feet, 5 inches. Very easy and simple to assemble not to mention extremely strong.